Golfing has been a way for my family to bond since I was in middle school. Going out with my dad and my brother to soak up some sun, b.s. and knock a few balls around the golf course made for an almost unbeatable day– even when I lost more balls than holes on the course. 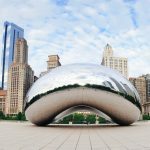 These Chicago golf courses provide a welcome escape from the fast pace of the city– whether you opt to visit one in Chicago, or one of the many golf courses near Chicago with your pals, family or even a solo run to help sort out that wicked slice you have with your 1 wood (or is that just me?). 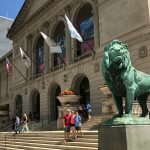 You’ll find a couple surprisingly close to Chicago, with the majority of them residing in the suburbs and surrounding cities. Beverly Country Club has been around since 1908, but in 2002, members adopted a rejuvenation plan to freshen up the golf course. The revamp of the course brought back many of the legendary features that had been lost over the years. 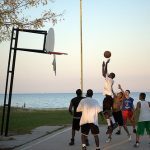 Playing at Beverly is like playing a piece of Illinois history. Butler National Golf Course is a private course that is worth paying the dues to. This course was utilized from from 1974-1990 for the Western Open tournament. That means that you’ll be playing on the same turf as some of the best. It was designed to be one the most challenging courses in the country and to push golfers to hone in their skills. Cantigny is one of the largest golf courses in the Chicago area. The 27 holes are comprised of 3 different 9 hole layouts. Each of the Woodside, Lakeside and Hillside courses provoke different challenges and great surrounds. Cantigny golf has also been host to the 2007 U.S. Amateur Public Links, the 1998 and 2002 Illinois Amateur Championship and numerous USGA qualifiers. 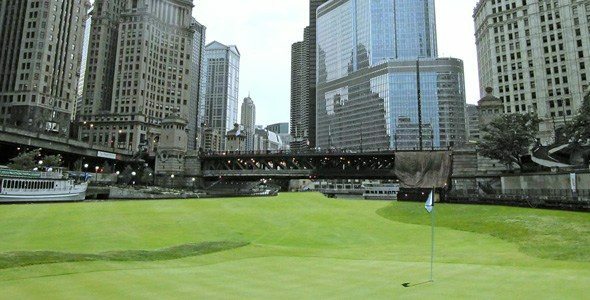 Aside from being one of the best Chicago golf courses, it is one of the most important courses in all of America. Chicago Gold Club was the very first 18 hole golf course in North America and the club that established the modern Out of Bounds rule. 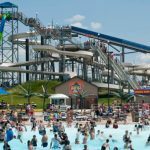 While this historic link may be at the top of many people’s list to play– it appears to be invite only, so start socializing. 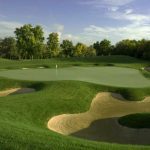 Cog Hill Golf & Country Club is considered one of the best Chicago golf courses for many reasons, but the fact that their grounds are made up of four 18 hole courses is highly impressive. One the courses, Dubsdread, has been named one of America’s 100 Greatest Public Courses by Golf Magazine. It has also hosted 20 PGA Tour events and 4 USGA Championships over the years. This is your chance to play where some of the best in the world have played. With the variety of courses, you have plenty to explore at Cog Hill. Harborside International Port Course is astonishing with its layout alone. 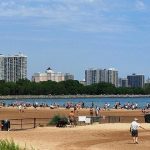 Views of Chicago’s skyline will be in the distance as you golf your way over terrain mimicking the rolling hills of Scotland. Three of the holes border the water of Lake Calumet and provides a phenomenal escape while golfing. It may only be 9 holes– but it’s 9 of the best holes in all of Illinois. Olympia Fields Country Club is situated in the woods south of Chicago. The landscape is picturesque and the history is rich. Founded in 1915, it has been considered one of the best Chicago golf courses ever since. Aside from a massive 36 hole course, it also boasts the largest private clubhouse in the world. Prairie Landing golf course offers rolling green hills in an otherwise flat surrounding. One of this course’s best assets is the water system running throughout the links. Aside from landlocked ponds, there are multiple large ponds that play a part in the holes, with a river channel running between them to add one more obstacle, and a lot more beauty. Shoreacres golf course is one that intertwines itself with the natural surroundings. Rather than having to build up or flatten the entire landscape, Shoreacres utilizes natural formations to test golfers’ limits. The most apparent of these being the many ravines scattered throughout the course. So many, in fact, that they have their own ravine ruling so you don’t obliterate your handicap. If given the chance, Shoreacres is truly a beautiful golf course to play. Stonewall Orchard’s testament to being one the best Chicago golf courses comes with them hosting multiple U.S. Open qualifiers and the Illinois PGA Section Championship. This 18 hole course has an abundance of thick forests, rolling landscapes, wetland and wildlife keeping you company as your play through. Golfing at Stonewall Orchard Golf Club is a tranquil experience– which is precisely what golfing should be. Thunderhawk golf course proves to be one of the most challenging and utterly beautiful golf courses in Chicagoland. 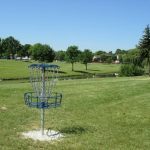 They were the first public golf course in Illinois to be awarded the Audubon International Signature Certification. This means that much of the golf course doubles as a forest preserve– hosting many restored wetlands, expanding the wetlands 17 more acres, and planting more than 900 oak and maple trees throughout. The tee boxes have multiple setups to accommodate almost all levels and skill and each hole proves to have its own unique challenge. Thunderhawk is must for any golfers that find themselves around Chicago. For free PGA golf tips and course reviews in the Southwest, visit GolfSW.com. If you’re a golf fan, you may enjoy fantasy golf! Play fantasy golf at DraftKings and get a free entry with this DraftKings bonus code.